I've remembered something about summer clothing. When it's hot, I want to wear the (socially acceptable) least amount of clothing. Unlike fall, winter, or spring, I don't often layer in the summer. Obviously, this lack of layers is beneficial for keeping cool, but I've found that it's detrimental for my wardrobe. I ask myself: What should I wear on a hot day? Then I answer (to myself, of course, because it would be awkward to respond aloud), "Shorts and a tee shirt." What should I wear on the next hot day after that? Well, that answer also would be shorts and a tee shirt. Just like that, shorts and a tee shirt becomes the summer uniform, the fashion equivalent of making a peanut butter and jelly sandwich for lunch every single day for three months straight. Quite frankly, it becomes unpalatable after a while. Being that I want to break out of this fashion rut before I fall into it, it's the perfect time to launch a new Focus on Fashion series about summer clothing. 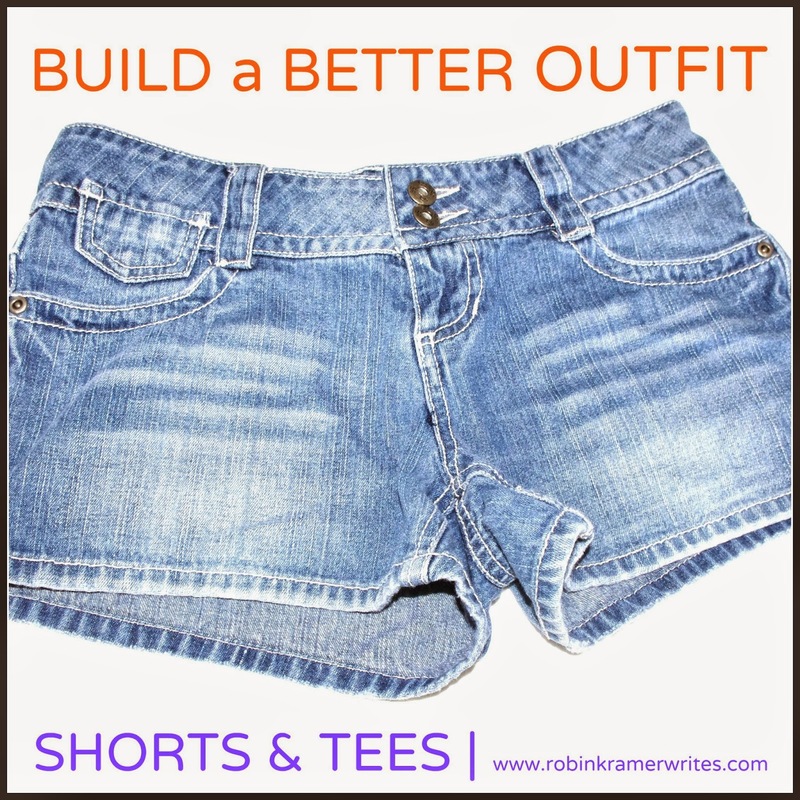 This series will run four consecutive Fridays, and today we'll start with the basics: how to build a better "shorts and tee shirt" outfit. 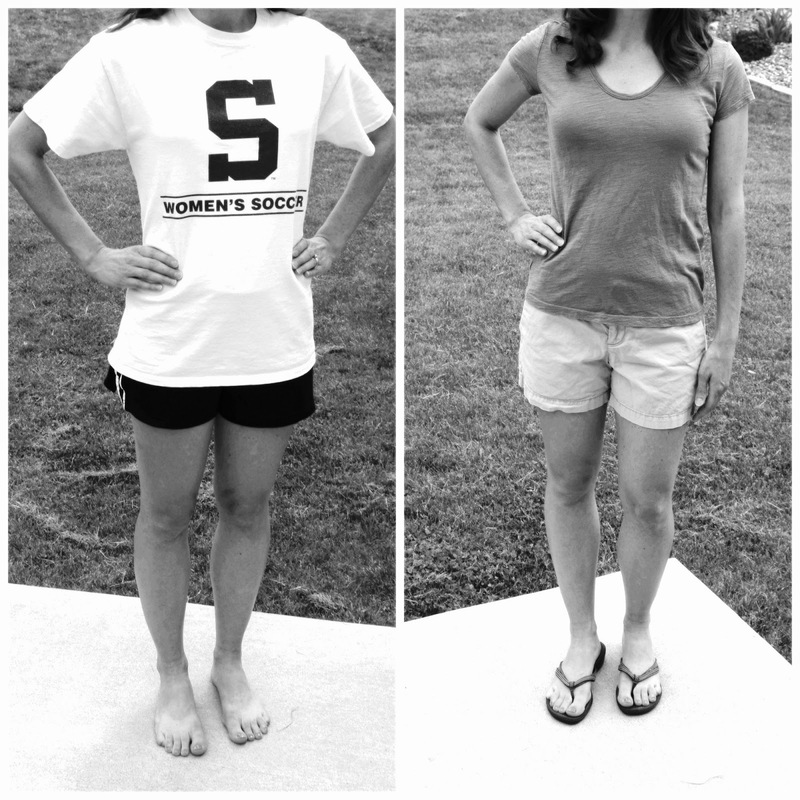 Based on my experiences, I can easily slide into two habits with shorts and tee shirts: the athletic ensemble (which, mind you, is unparalleled for comfort, perfect for exercise, and great for yard work) and the no-frills, non-upgraded, slightly wrinkled khaki-or-jean-shorts-topped-with-an-untucked-plain-shirt ensemble (which just kind of happens). Clearly, neither of these are options are going to land me on the list of most egregious outfits ever to be spotted at Wal-Mart, but I can do better. And by better, I mean that it's amazing how even the simple addition of a belt, like in the outfit below, makes you quickly appear more polished. This combination is remarkably basic, but I feel pulled together when I wear it. A v-neck tee shirt is universally flattering. 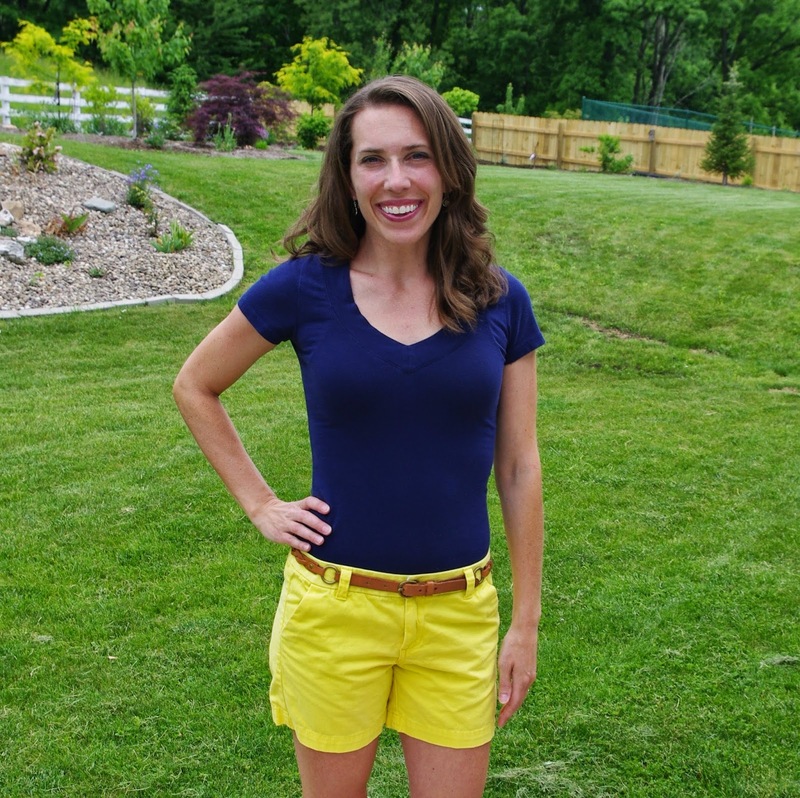 Plus, the simple navy hue of the shirt grounds it as a neutral and lets the yellow shorts pop. Pair the outfit with a cute pair of sandals or wedges, and you're out the door. The next upgrade to a simple tee and shorts combo are accessories. This basic white tee and clean-lined seersucker shorts (which, for some technical reason beyond my comprehension, are showing on the screen like a wonky zebra print) are enhanced with a long necklace and my favorite wedges﻿. If I'm feeling especially ambitions, I can upgrade a tee shirt for a lightweight blouse, like this cute combination where the red shorts add a flash of interest without overwhelming the delicate pattern of the blouse. And those red shorts? (Target, my friends.) They're a respectable length with a nice fit. While bold, they're versatile. They'd be great with a white or gray tee shirt for casual wear, or they could be dressed up with a black tank and strappy sandals. So, this summer, I'm determined to slide -- on slides at playgrounds and parks, that is -- but not to slide into the boring shorts and tee shirt uniform. 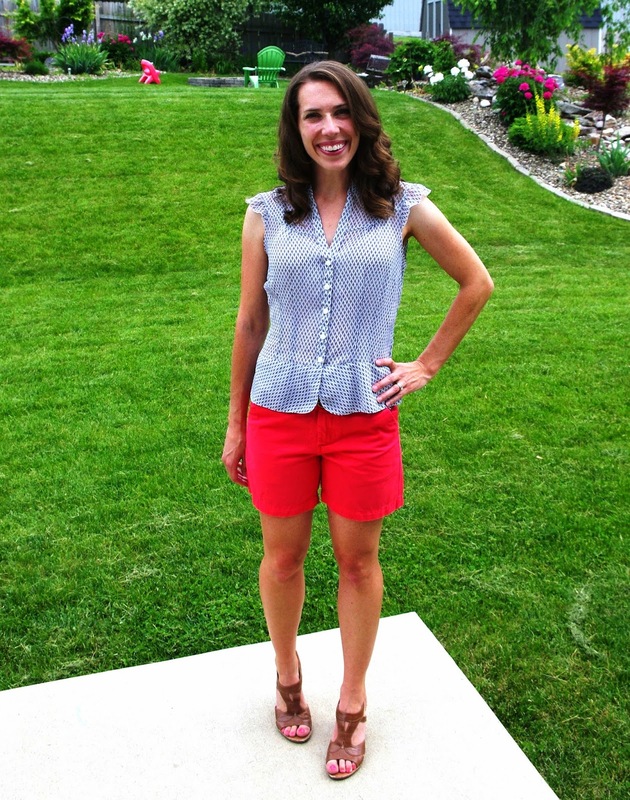 Join me every Friday in June for more practical summer Focus on Fashion posts! We certainly don't get the kind of heat that you get in Texas, but I hear you with the tank tops. It's nice to have something light and airy when the temperature is oppressive! Tanks are a great way to go! Glad you like yellow shorts!